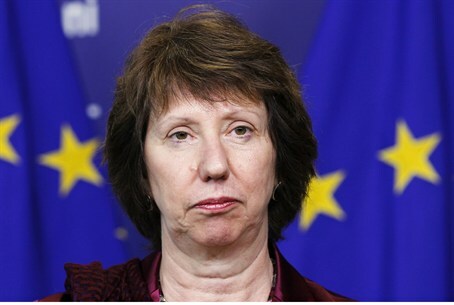 EU foreign affairs chief Catherine Ashton demands Israel stop construction for Jews in Judea and Samaria. EU foreign affairs chief Catherine Ashton called on Israel to reverse recent announcements regarding construction in Judea and Samaria in order to advance peace talks. Ashton said she viewed with "great concern" an Israeli decision to declare an area near the Gush Etzion Bloc south of Jerusalem as state land and the recognition of Jewish rights to the disputed Peace House in the Judean city of Hevron, a statement from her office said Friday. Ashton also lashed out at the "demolition of Palestinian property and the confiscation of EU humanitarian aid". Earlier this month, an EU official said Israel had demolished several EU-funded "humanitarian housing shelters " in an Arab settlement near Jerusalem. "The EU calls on the Israeli authorities to reverse these decisions," Ashton said. Such events are "not conducive to the climate of trust and cooperation needed for the current peace negotiations to succeed," she added. Israeli officials have not yet responded to Ashton's statement, but EU officials have previously been accused of aiding illegal activities by Arab and far-left activists under the guise of "humanitarian activities". In one incident last year an EU official physically assaulted an Israeli soldier as she took part in an anti-Israel demonstration. Ashton made no reference to Palestinian Authority moves which caused negotiations to collapse, including its repeated refusal to recognize Israel as the Jewish people's nation-state, and the decision to unilaterally apply for membership in 15 international agencies. However, she did condemn "the recent killing of an Israeli man in the West Bank" and call "for an immediate end to all acts of violence" - a reference to the murder of Baruch Mizrahi near Hevron by Arab terrorists, in an attack which also injured his pregnant wife and a nine-year-old child. All sides should "show utmost restraint and responsibility in order not to jeopardise the current negotiation process," she said.